Thumbsaver™ is the CAMX solution to a number of crossbow design challenges. First and foremost, the crossbow should protect the shooters front hand from the inherent risk of a fast moving bowstring but at what cost? Most manufacturers lower the forearm drastically, placing shooter in an unnatural and uncomfortable position. Next they build in wide, heavy flanges which interfere with accurate cocking. Usually, these flanges only provide protection for a portion of the strings travel path. 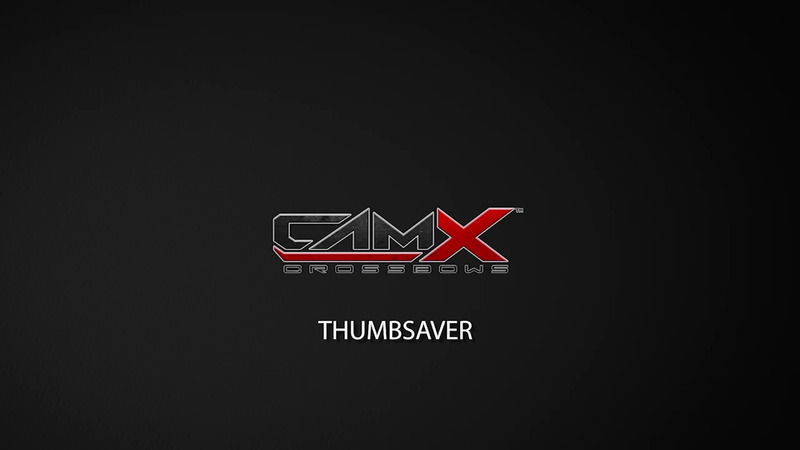 The CAMX way – is the Thumbsaver™. The CAMX Thumbsaver™ difference is that it protects the shooter for the full travel path of the string. The Thumbsaver™ design allows the shooter to place the front hand wherever the shot dictates, back or front, silhouette or “shotgun” style. Hunting situations require flexibility and the Thumbsaver™ delivers complete protection without restriction. Next, the Thumbsaver™ folds flat against the barrel to allow perfect, precision cocking of the bow by hand or with the use of a rope cocking aid. When cocking is complete, the Thumbsaver™ springs back to its permanent position of protection. Its unique red color with permanent warnings continually remind the shooter to keep their thumbs and fingers below the travel path of the bowstring. The revolutionary Thumbsaver™ not only protects you better, it keeps the fit, feel and comfort in your shooting.